Serena Williams' astonishing row with umpire Carlos Ramos at the US Open final overshadowed Naomi Osaka's maiden grand slam title. 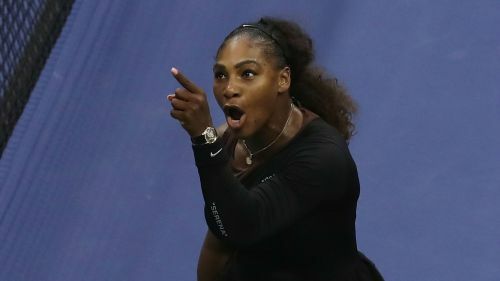 Williams erupted having received a code violation for coaching and a further punishment for racquet abuse, before she branded Ramos a "liar" and a "thief", conduct which earned her a game penalty and, later, a $17,000 fine. The 23-time grand slam champion alleged she was being treated differently to her male counterparts. In an attempt to understand Williams' Flushing Meadows meltdown, Omnisport spoke to sports psychologist Andy Barton for his reading of the outburst. WHAT MADE SERENA LOSE IT? Williams' tirade focused on the notion she was “cheating” following the accusation she received coaching - something she denied, though Patrick Mouratoglou later conceded he attempted to convey messages to his player. At one point Williams referenced her daughter and standing for "what is right". Barton said: "You've seen her brush things off – a bad mistake, a lost set, a bad call. This thing she just couldn't shake off. "I think she saw it as, 'You're attacking me, my family, my values'. That hit her in a place that was much more powerful than losing a game." WHY DID SHE USE THE LANGUAGE SHE DID? In Williams' extraordinary rant, she told Ramos he would never "be on another court of mine", words that Barton found curious. "It was very proprietorial," he added. "Her strength is her self-belief. You work with clients to own a space. Somewhere like Flushing Meadows, that's hers. HOW CAN A HIGH-STAKES MATCH IMPACT THE MENTAL STATE? Williams was chasing a record-equalling 24th grand slam title and is not the first to unravel in a final. Zinedine Zidane was famously sent off in the 2006 World Cup final after responding to abuse from Marco Materazzi by headbutting him. "You have these heightened emotions. Your arousal levels are up, your stress levels are up," Barton explained. "If you get a trigger you're not prepared for, that's when you can blow up. It was probably a similar thing with Zidane." WILL THE REACTION SHAPE HER THOUGHTS? Reaction to Williams' rant has differed. Ramos was booed by the Flushing Meadows crowd, while there was some applause to Williams’ explanation at a press conference. "Confirmation bias is how you hold onto a belief,” Barton said. “You see this with Brexit - whichever side of the equation they're on, they filter out anything that goes against their views. HOW WAS OSAKA ABLE TO STAY COOL? Amid all this, a 20-year-old who idolises Williams kept her eyes on the prize. Osaka said afterwards: "When I step on the court, I’m just a tennis player playing another tennis player. When I hugged her at the net, I felt like a little kid again." Barton added: "She was extraordinarily focused and sometimes when you're in that state you do filter a lot of stuff out. "You're playing the shot, not the player. You're thinking of a target and aiming for it. You're staying very present." Can any player outside the Big 3 win a Grand Slam in 2019?